If you want to see Christmas lights, the #1 place to go in the country is the South Brooklyn neighborhood of Dyker Heights, according to a survey published today by MSN. Coney Island’s amusement area doesn’t have a tradition of Christmas lights since the parks are closed for the winter, but two of its official New York City landmarks are lit for the holidays and free to view. 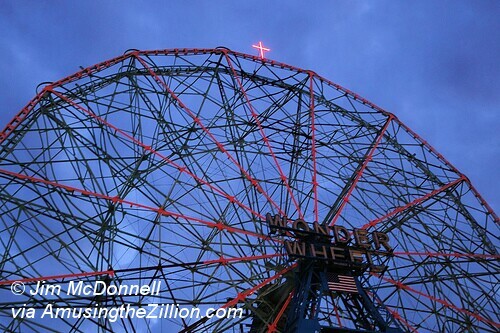 While the lighted cross atop Deno’s Wonder Wheel has a 68-year history, the Parachute Jump’s light show is brand-new. 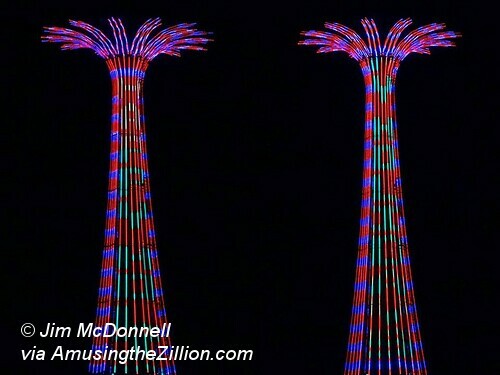 The Jump’s dazzling 8,000 LEDs debuted in June and have been specially programmed with a “Happy Holidays” message and Christmas-y colors by Luna Park. Currently, the Jump is lit from around 4:30pm until midnight, and sometimes later. Originally built for the 1939-1940 New York World’s Fair, the Parachute Jump operated as a ride in Coney Island’s Steeplechase Park until 1964. Today the landmark is known as Brooklyn’s Eiffel Tower. Check the Coney Island webcam to be sure the Jump is lit before you go. The annual tradition of putting a lighted cross atop the Wonder Wheel during the Christmas season began in 1945 to mark the end of World War II and the troops return home. During the war years, Coney Island was dark after sundown because of “dim-out” and “blackout” regulations to protect shipping from being silhouetted for the enemy by the glare from the shore. The new LED cross was made by DJ Vourderis, whose family has owned Deno’s Wonder Wheel Park for 30 years. Built in 1920 by the Eccentric Ferris Wheel Company, the Wheel is in operation from Palm Sunday through October. Its cars are removed for the winter and put back up in the spring prior to Opening Day. From the 1980s until neighboring Astroland Park closed in 2008, the Wonder Wheel’s Christmas cross had a counterpart in the Astrotower’s lighted Star of David. In this lyrical video by Jim McDonnell, who also took the beautiful photos in this post, you can see the cross being raised on Friday when warm temps finally melted the ice on the Wheel, allowing it to be turned. The cross remains atop the Wheel until around January 6.